Last weekend was Woolfest 2006. It was held in the UK, in Cockermouth, Cumbria which is on the North Western edge of the Lake District. No, I didn’t get to go (dream on, Leigh) but I was affiliated with it through the Online Guild of Weavers, Spinners, and Dyers of which I am a member. The Online Guild is was formed in May, 2002 under the umbrella of The Association of Guilds of Weavers, Spinners, and Dyers in the UK. 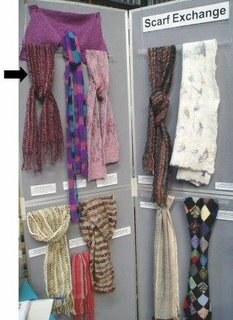 It's purpose is to provide a community for fiber and textile artists worldwide, who aren’t always able to participate in their local, regional guilds. I joined in July of that year and quickly became involved. One of my contributions was to lead a spontaneous knitting workshop in January of 2005. 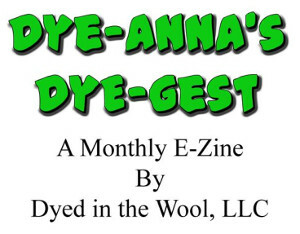 It was based on our new year’s resolutions to clean up our yarn stashes and use up odds and ends. This lead to a Friendship Scarf exchange a few months later. 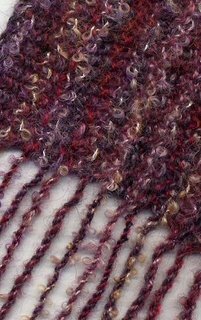 I knitted and sent my scarf off to Scotland and received a beautiful double fringed inkle woven boa from England. This year a number of these Friendship Scarves were displayed at the Online Guild’s booth at Woolfest, and mine was included! The pattern is a self fringing, sideways garter stitch pattern from the Winter 2002 issue of Spin-Off. I used both handspun and commercial wool and mohair yarns. 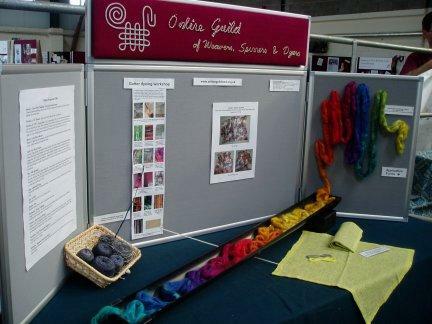 The Woolfest images are used with the kind permission of their photographer, Margaret Parker, who is also the founder and convenor of the Online Guild. We love new members, so if you are interested in joining us or seeing what the OLG is all about, please click on one of the Online Guild links. Hi Leigh, Thanks for your lovely comments about my yarn.. 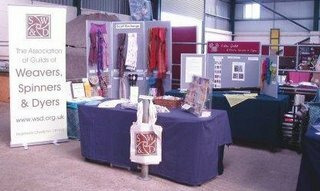 Here I am bouncing back to take a look at your lovely work... what a beautiful scarf!!! Don't you just LOVE the sideways garter stitch - so simple yet impressive!! I'm off now to take a look at the online guild too!! see you soon!! That is fabulous about your scarf! And the scarf is gorgeous, too. Great blog! It's a nice feeling to have people admire your work! Even nicer to have them proudly display them! What a beautiful scarf.